Life in Playa del Carmen just keeps getting better and better! When we moved here, almost five years ago, the options for foodies and oenophiles were very limited. Having sold fine wine in a previous life, the transition from my gourmet lifestyle took me by surprise. Certainly, I had never expected to have the variety that I was accustomed to back in New York, but if you told me that I would be making all of my "better" wine purchases from Sam's Club.....well, I might have never gotten on that plane! Since then, I have adjusted to my surroundings and learned to not only accept but appreciate the regional ingredients and imported products that are available in this area. Over the past year, I have noticed that the opportunities for food and wine centric events seem to be on the rise. Wine shops like Off the Vine are doing a brisk business and offering memberships for weekly tasting dinners and wine pairing evenings. In the past year, I have attended wine tasting events at Ajua Maya and on the glamorous Hotel Cielo rooftop above Carboncito's. Perhaps the most grand celebration of food and wine is yet to come with the advent of Taste of Playa in September. Suddenly, I don't feel so alone in my search for exciting culinary experiences. 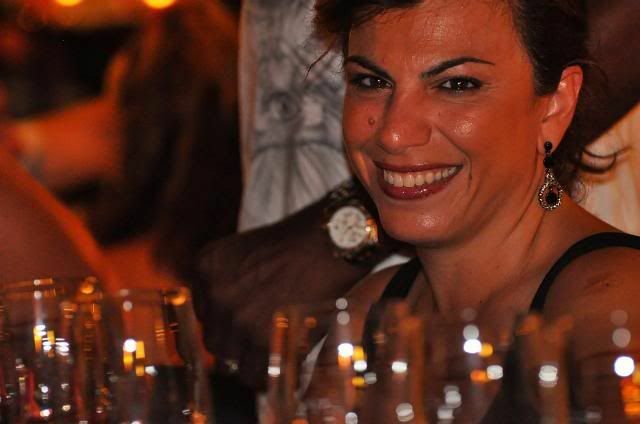 It is obvious that the residents of Playa del Carmen are ready to have their palates challenged and will avidly seek out chefs and sommeliers to entertain their appetites. Last evening, I had the pleasure of attending the inaugural gathering of the Uncorked Club in The Den at John Gray's Place. Always thinking around the next bend, John has been consistently creating opportunities to make good food and good wine, accessible, affordable and fun for the residents of Playa del Carmen and the Riviera Maya. His latest brainchild, The Uncorked Club, is designed to take the stress out of wine and food paring. 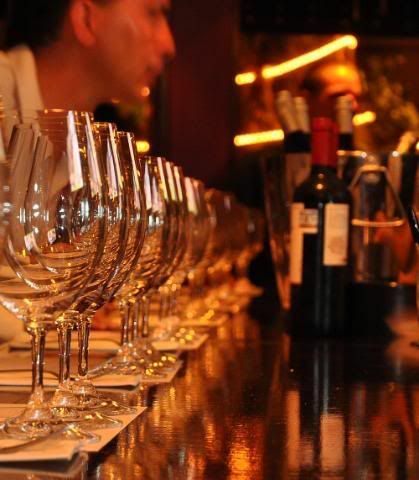 We have all heard "the rules": white wine with fish, red wine with beef, blah, blah, blah. Rather than following rules and emphasizing traditional pairing strategies, John challenges his Uncorked Crew to experiment. 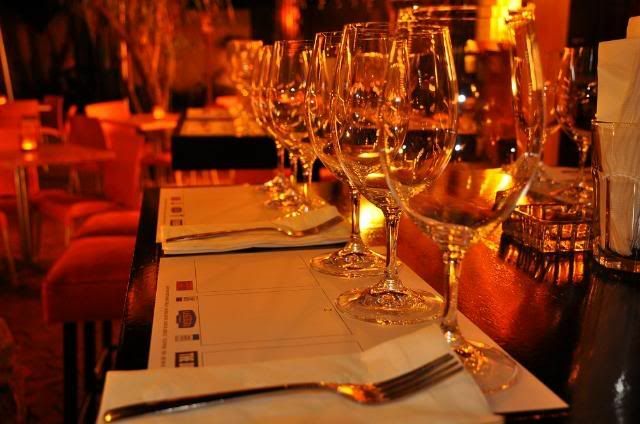 All three of the featured wines were offered at once, giving the diners a chance to sample each of his small tasting dishes with each of the wines. Sure the Amberjack tasted great with the Rolf Binder Riesling but the accompanying burnt butter and kalamata olive compote went perfectly with the fruity Duck Pond Merlot and the even the bold, spicy, Chilean Primus blend. The White Bean Bruschetta we initially thought would be a spot on match with the Riesling, but the bacon added in the cooking process made the reds a better choice! Not only did our group have an opportunity to sample and purchase wines that have never before been offered in this area but I personally was able to sample some of John's menu items that I had ever thought to try previously. I was surprised and delighted and now I am eager for more! John has plans to offer these wine parings evenings on a weekly basis and provide additional benefits to members of the Uncorked Club. After the tasting is over, diners have the option to purchase larger portions of their favorite dishes for an additional charge of just $50 pesos per plate. The select wines remain available by the glass and bottles can be purchased at a reduced rate by Uncorked members. Do I sound excited? I am! This is just the kind of culinary initiative we need more of in this rapidly growing, cosmopolitan city. 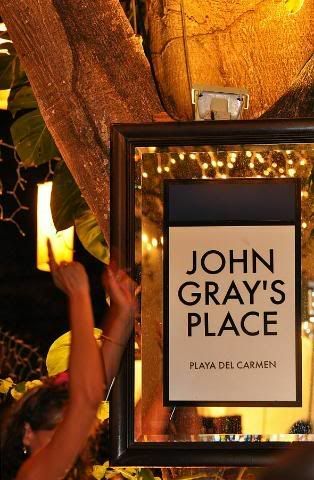 I am pleased to announce that John Gray himself will be participating in the exciting gastronomic graze, Taste of Playa. 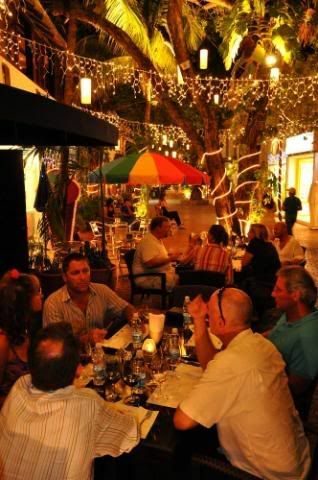 John has just recently been featured in the Gourmet Edition of InRiviera Magazine and will be a participant in the prestigious South Beach Food and Wine Festival in 2010. We are thrilled to have him on our team and look forward to seeing which of his many delectable creations he offers up that day. To those of you who have not yet had the pleasure of dining at one of John's restaurants, I highly recommend you fit a special meal into your plans. A visit to any of his signature venues in Playa del Carmen, Puerto Morelos and Cancun is well worth the effort and the Sunday BBQ at La Suegra in Puerto Morelos is a wonderful place to spend a lazy afternoon with your family. Maybe we will see you at an upcoming gathering of the Uncorked Club at The Den. We'll save you a seat!! Special thanks to Stuart for taking beautiful pictures so that I could fully enjoy my dining experience. Great shots as always, Stuart! What a BEAUTIFUL blog entry! Oh you know how I love find food and wine, I am SOOOOO excited about this! I absolutely LOVE to see how Playa is becoming more cosmopolitan. The photos are amazing. I can't wait to get to John Greys again. Was Yannik presiding? Is this a regular event? These types of sampling/pairing things are what I *LIVE* for. Besos, dahling! Thanks Stewart! It's remarkable how many restaurateurs and chefs are starting to really step up to the plate. We should all plan to go out for an even ing the next time you and Kelli are in town!